There’s so much to say about both the Texas Revolution and the Mexican - American War but we must first learn that these military conflics are not one in the same. Yes, the Texas Revolution may have been one of the catalysts for the Mexican War, 10 years later, but truly, they are two military efforts, akin to the Revolutionary War and the War of 1812. Overview. We are all familiar with The Alamo, Sam Houston, and the Battle of San Jacinto that lasted less than 20 minutes, but what do they have in common? 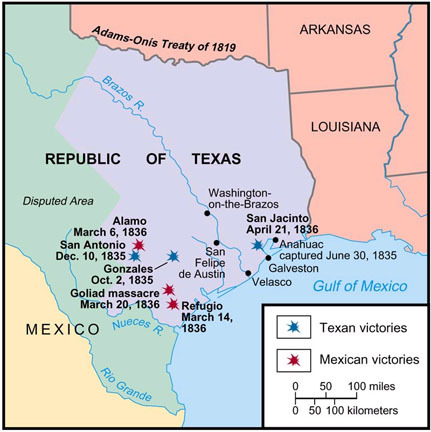 They are all related to the Texas Revolution, also known as The Texas War of Independence, 2 Oct 1835 - 21 Apr 1836. American colonists, joined by Mexican settlers (Tejanos) forced their independence from Mexico’s conservative government which resulted in the Republic of Texas. With the help of Texas sympathizers from the US approximately 2500 men fought for this effort (against approximately 6000 Mexican troops). Early settlers, 1820-1830, mostly from the US deep south, who entered the region of Tejas of the Republic of Mexico were required to vow allegiance to Mexico and agreed to being Roman Catholic. And although slavery had been outlawed by 1829 in Mexico, it was allowed for an additional year (1830) in Tejas for the American settlers. 1835 War of Independence. It was this year that conservative Antonio de Padua María Severino López de Santa Anna, known as Santa Anna, became the President. It was this year that Santa Anna promoted his power by enforcing the newly mandated conservative “Siete Leyes” (7 laws). The Siete Leyes established a national government that abolished state legislature to include that of Tejas, denying them of any independent state control. 1836 Revolution Ended. The Revolution ended at the Battle of San Jacinto which lasted less than twenty minutes on 21 April 1836. 1836 - 1845 The Republic of Texas. The Republic of Texas was independent of Mexico and earned diplomatic status from the US, France and Britain. Sam Houston was elected President. However, Mexico still claimed the Texas territory as part of the Mexico. 1846 Mexican - American War. Keep in mind that the Texas Revolution ended in 1836. Know that the US declared war against Mexico 1846, abt 10 years later. 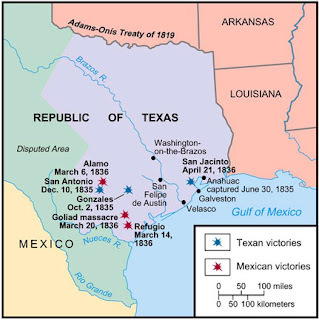 After the Texas Revolution, the United States claimed the Rio Grande as its southern border, based on the Treaties of Velasco; whereas Mexico claimed the border as Nueces River, north of the Rio Grande. Efforts to acquire (purchase and negotiate) the Mexico territories of Alta California and Santa Fe (NM), to include the Nueces Strip in Texas, failed. The first skirmish - the Thornton Affair (Thornton Skirmish) was along the disputed Nueces Strip. This skirmish led President Polk to lead Congress to declare war against Mexico 13 May 1846. Of course it is well known that the Mexican - American war resulted in the USA gaining California, New Mexico, Utah, and Nevada and parts of other states. And, it also quieted any questions regarding the southern border of Texas. To fully understand this war and the importance of continental expansion, it is vital that historians and researchers understand the American culture of the 1840’s and the role Manifest Destiny played in the decision for westward expansion. In addition to battle museums across Texas, researchers must know that Texan settlers were not exclusive in serving in the Texas Revolution. There were the Georgian soldiers, Kentucky (Mustangs), Alabama (Red Rovers), Mississippi (Mauraders) and soldiers from the other southern states. Each state should be researched for relevant repositories. For example there were about 120 militia men of the New Orleans Greys (13 Oct 1835) who joined the efforts of the Texas Revolution. Here are 5 good repositories for research. Officers and Men of the Texas Republican Army are posted by Company on Fold. Texas General Land Office. Texans who served in the Texas Revolution were extended land bounty and donation grants for 640 acres. For more information on the the issuance of bounty and donation grants reference TSHA –Land Grants. Very useful post. Thanks for providing this great information. As a native Texan who often hear folks refer to the Texas Revolution as the Mexican American War, it is refreshing to see someone understands and know there is a difference between these major conflicts. I do want to add that Slavery was allowed in Texas way beyond the 1830 reference you make above; I have too many ancestors in my family tree as proof of that. News of freedom for all slaves in Texas really didn't arrive here until the middle of June in 1865. That is why Juneteenth (June 19th) is such a major celebration for African Americans in Texas today. Excellent post; again thank you for writing it!